The dawning of a New Moon is an auspicious event. We cannot see it, for the pairing of the Moon and the Sun do not allow for the reflection of the Sun’s light upon the Moon. When it is not her time to shine, the stars shine ever more brightly. On an inner level, so do we. During the dark of the Moon, we know that she is there. This is called faith. The past month has been vigorously challenging on many fronts. We are emerging now with increased strength, fortitude, and confidence; for we have navigated these recent challenges with courageous fervency. Within the realm of what is a visibly dark sky, there is within the darkness of our own consciousness, nascent stirrings of ancient knowing. At this juncture, we are highly subjective and necessarily so. The time is ripe in which to fully realize our own inner knowing without the unwanted influences of the outer world. As we fully inhabit our completeness, the world greets us with opportunities completely tailored to our soul’s authentic path. 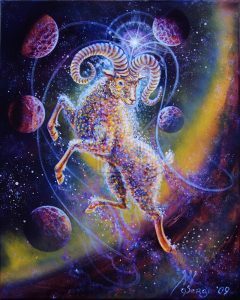 Aries The Ram is a masculine cardinal fire sign embodying the archetypes of The Pioneer, The Warrior, The Daredevil, The Loner, and The Survivor. Aries exudes the qualities of individuality, assertiveness, innovativeness, independence, courage, aggression, passion, ferocity, and leadership. 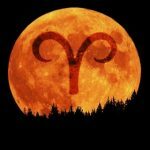 Keep in mind, that often times an Aries person does not naturally possess these characteristics, but rather, has come into this incarnation to explore and learn how to embody and express them. For this, it takes the inner Warrior to realize our full nature as we ward off the outer voices which have quelled the magnificence of our being. In doing so, there is loneliness. Afterall, The Ram is a loner scaling the mountainside. As with every sign, there is an evolutionary scale. wherein each individual expresses. While we possess the inherent potential and soul knowledge for fully evolved expression, some of the qualities and characteristics of a sign within us are still in process. We strive to bring those hidden areas of ourselves; both the flawed and the virtuous, into consciousness; for consciousness itself is the great emancipator. Wherever Aries resides in our natal chart, the next three days will energize that particular area with the spirit of warriorship, urging us to begin anew. It is an opportunity to discover deeper layers of the Aries expression within us. It is an opportunity in which to become more conscious. New Moons require privacy and introspection. It is within the quiet solitude of this time that revelation visits upon us. We are embracing the wound of the unrealized self, rising to the emergence of a deeper level of our individuality. We are facing the places where we have shown up inauthentically. 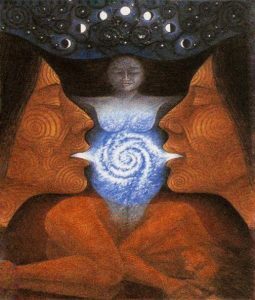 Emanating from the heart, the small still voice within unveils to us hidden aspects of our nature; yet nevertheless authentic and true. Now it takes the courage of Aries to express this profound dimension of our being. Be both brave and tender. Wrap your arms around yourself as you prepare to enter a new arena. As you scale the depths of your being, you will discover that the heart is a mountain in which there are embedded jewels. What we ardently harbor in our evolved hearts will serve as cosmic grace that will lead your way. Go forth and beam the magnificence of your being. Aries New Moon Blessings Upon You. The spiritual warrior hides from nothing. We jump into the fire, we dive into the ocean. We become the sea. The New Moon arrives at 15 degrees of Pisces on Wednesday, March 6 at 11:51 AM EST. We open this lunar cycle with an air of dreaminess and wonder. New Moons herald beginnings. This particular juncture offers us an opportunity to surrender and let go without the knowledge of concrete plans or happenings. 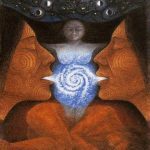 While we are in the center of exactly where we need to be, three dimensional reality bears a burden at this time; for we are resonating with the higher realms that draw us to the transpersonal experience of our human existence. It is a time in which to integrate the essence of our spiritual nature with the authentic human being that we chose to inhabit as a means for soul growth and evolution. 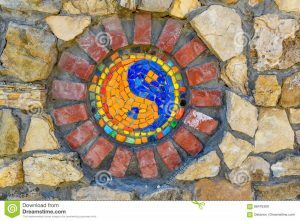 As we swirl with the transpersonal realms, life can be quite confusing and overwhelming at this time as we navigate our daily lives with its multitudes of details. The New Moon in Pisces will whisk us into our wishfulness, our wondering, our creativity, and our higher self. And within these experiences, there is chaos. When planetary rulers of signs accompany the planets in those signs, we have an intensified experience of what that particular sign, in this case, Pisces expresses. 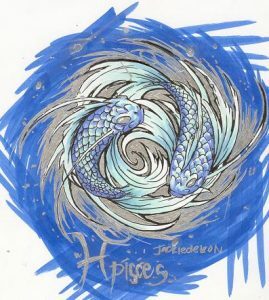 The ruler of Pisces is Neptune. Neptune is traveling closely with the Sun and the Moon offering an invitation to access our higher nature. Pisces The Fishes is a mutable feminine water sign ruled by Neptune. It embodies the qualities of compassion, sensitivity, empathy, psychic ability, creativity, otherworldliness, emotionality, and spiritual attunement. When Pisces is expressing within its shadow realm, the roles of martyr and victim can take hold; as Pisces carries the weight of the world, seeking to heal all sentient beings. One of the most profound lessons for Pisces is the realization that in order to heal the world, one must heal oneself. Pisces can also manifest as chaos and confusion. Psychological states of illusion and delusion are significant challenging qualities of this sign as well. A profound imagination can conjure both the positive and the negative experience. 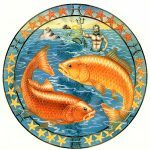 A direct line to The Divine is essential for Pisces to navigate earthly reality, for such spiritual guidance can facilitate the astute discernment that is required for personal fulfillment. Somewhere within our natal chart, a realm of Pisces resides. We have all of the signs within our nativity. It is in understanding where they operate that we can flow more with the energy of our path. Wherever Pisces resides in your chart is a place of tremendous sensitivity and attunement. It may also present the challenges of confusion and disarray. The more one is attuned to Spirit, the clearer and more ordered life becomes. The New Moon in Pisces offers a fresh awareness of what resides there as you embark upon a new phase of your journey. Accompanying the New Moon, there are other significant planetary events that will transpire. On this very day, Uranus will make its ingress into Taurus. When an outer planet changes signs, there is significant change both personally and collectively. Uranus represents breakthrough, change, revolution, and independence. It is also where attunement and concern for the collective is expressed. The key to navigating this challenging shift is to stay grounded. Additionally, Mercury will also station retrograde on this day. As is well known, Mercury retrograde cycles can be both growthful and challenging times. Attunement to details is paramount. At the same time, it is an optimal time for inner processing, planning, and preparation. Exercise patience as there may be annoyance and inconvenience within one’s daily life. Mercury, The Messenger Of The Gods, is our guide through the Piscean realms, helping us to integrate multiple worlds. There is a vast array of energy to manage at this time. Our emotional nature is challenged. Pisces is where our energy field is wide open. There may be weepiness for ourselves and the world. We may feel that life is out of control both personally and collectively. The integration of these simultaneous planetary occurrences requires both fortitude and gentleness. Within the plan, there is free will. The guidance for how to direct our free will is readily accessible. Take a moment of quietude. Allow for the flow of inspiration. Surrender. Let go. Reach out to your Higher Power, to God, to The Universe. Touch the tender places with tenderness. PISCES NEW MOON BLESSINGS UPON YOU. The New Moon arrives at 15 degrees of Aquarius on Monday, February 4 at 4:03 PM EST. New Moons are a time in which faith is called for. It is a time of internal fortitude whereby we remain close to ourselves within ourselves. The darkness of the New Moon does not illuminate an understanding of what is yet to come. It is instead, a time of contemplation in which seeds of new life are patiently germinating. The new lunar cycle has begun, though we have yet to see what may unfold. This is where we call upon faith. Know that there is emergence from the dark as the waxing light incrementally enhances our consciousness while the new landscape gradually unfolds before us. New Moons enhance the ability to remain close to oneself, sifting through the subjective consciousness that is profoundly available to awareness. Such subjectivity is necessary in order to awaken the true self. When in one’s own truth, the journey becomes navigable; for the universe is consistently conspiring to assist us in both earthly and spiritual matters. Even though we cannot see at this time, we must take the leap of faith in which to break through to the next phase. New Moons are secret presents from the universe. When they are found out, the Moon’s rescinded light acts as rite of passage. We have this opportunity each and every month. So much can change and shift and fluctuate, just like the Moon. Each and every night she has changed just a little bit. Whether she is waxing or waning, she is never the same. She is our time keeper. She assures us that the only permanence in life is change. Aquarius The Water-Bearer is a masculine fixed air sign ruled by Uranus. Archetypes which accompany this sign are The Genius, The Scientist, The Fool, The Truth Sayer, and The Exile. The characteristics of this sign are brilliance, inventiveness, rebellion, intellect, individuality, humanitarianism, detachment, non-conformity, uniqueness, and an ardent need to speak truth. 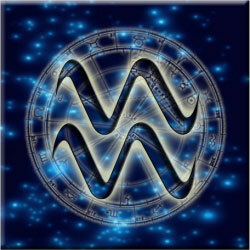 Aquarius The Water-Bearer is often misconstrued as a water sign, when it is in fact an air sign. Air has a tremendous need for freedom, communication, intellectual stimulation, and the pursuit of truth. An Aquarian mind is quite active, often incurring states of anxiety as multitudes of thoughts inhabit the mind simultaneously. There can be a great sense of overwhelmed-ness for the Aquarius’ wheels are always turning. Where are they to begin? Foolishness entails a great deal of courage, wisdom, and resourcefulness. As in the Tarot image of The Fool, a powerful archetype, we are invoked with trust and a free spirit. We journey to a point of destination who knows not where. The process of journeying will manifest our arrival. And within that arrival, we keep in mind that this place too is only temporary for what necessitates this stage of our soul’s evolution. 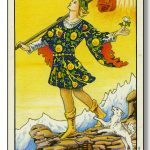 The Fool knows this, always ready to pick up his bags as he follows profound callings to the next stage of life. During the next three days of this New Moon cycle, your core being is longing for you to hear the call of your own voice. Heed the call; you will meet yourself. Wink at the stars. Follow your third eye. Bless yourself. Now, jump! Aquarius New Moon Blessings Upon You. The New Moon arrives at 15 degrees of Capricorn on Saturday, January 5 at 8:28 PM EST. It is the first New Moon of the New Year. As both events pertain to the birthing of profound beginnings, we are endowed with a deeper energetic potency in which to realize ourselves and the multitudes of dimensions that we have traversed thus far. Now, we embark upon a new phase of our soul’s journey. There may even be a sense of urgency. We are all longing for something. In the end, no matter what we may manifest, the ultimate longing is for that of one’s truest self. It’s easy to get swept up and lost within the collective consciousness. We may feel ourselves flailing in the wind as world events unfold. Coupled with personal challenges within our own world, life becomes overwhelming. We strive to cope with the miasma of our times. And yet, we are doing much better than we may realize. This New Moon in Capricorn is a partial Solar Eclipse. Eclipses bring an even deeper awareness of the dramatic changes in our lives that are inevitable. Capricorn is super grounded offering us an opportunity to catch our breath as we step off of the treadmill of our complicated existence. When we align with our own divine nature, we allow ourselves to step lightly into our experiences, allowing them to illuminate our lives. When we proceed lightly,we become en-lightened. 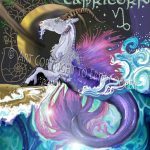 Capricorn The Sea-Goat is a cardinal feminine earth sign ruled by Saturn. The qualities of Capricorn include integrity, responsibility, loyalty, dutifulness, melancholy, tenacity, leadership, seriousness, aloneness, wisdom, and fortitude. Capricorn embraces the archetypes of The Wise Elder, The Builder, The Hermit, and The Father. 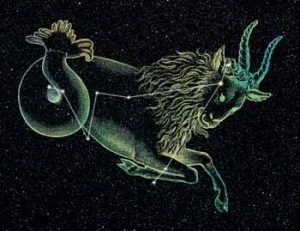 Capricorn The Sea-Goat has mastery over both the oceans and the mountains; water and earth; emotion and stability. Sometimes we find that we need our flippers and other times we need our trekking shoes. Capricorn vacillates between both terrains. However when this energy is assimilated, we can navigate both energetic realms as if they were one inherent of itself. Each New Moon arrives with a cast of cohorts who embellish the energy of the cycle. This high powered New Moon includes the company of Sun, Moon, Mercury, Saturn, and Pluto. All are in the sign of Capricorn. As Saturn is the ruler of Capricorn, it figures as the most prominent companion of the New Moon. Thus, as Saturn instructs, we are enriched by our willingness to climb mountains and swim oceans in order to arrive at a cherished goal or manner of being. We may recognize a tenacity unknown to us before. We have what it takes. We are both the student and the teacher. Perhaps the greatest lesson that Capricorn offers is the ultimate significance of being who we truly are endowed with integrity and a willingness to seek higher ground. During these next three days, while the climb may seem more arduous, know that there is a summit. Each summit, each shore, is but a stopping place in which to assimilate and integrate what we have striven so hard to achieve. There are more summits and shores to come. We are in a constant state of evolution. We peak within the process of becoming. Know, that there is no beginning and no end; there is only the ephemeral landing place. Once you have arrived, kiss the ground. For it is holding you. Capricorn New Moon blessings upon you. The New Moon arrives at 15 degrees of Sagittarius on Friday, December 7 at 2:20 AM EST. The New Moon is always accompanied by an air of mystery; a sense of the unknown; a spirit of anticipation. We are about to embark upon something new. Something has ended. It could be the expression of a facet of our psyche, a style of communication, a job, a relationship, or a way of thinking that no longer serves us. We are inhabiting our intimacy with self. This emotional attunement inspires introversion, introspection, and solitude. Such a state of being may be quite subtle. The Moon often is. As she touches upon the most intimate areas of our psyches, her energy is deeply personal. As is the Moon, so are we. A time of great respite is upon us, as the expansive Sagittarius New Moon is fueling the collective psyche with faith, hope, and optimism. There is a sense of magic in the air. As we dwell within this season of lights, we gather a glimpse of our own light. Our inner and outer vision recognize the light that is within us all. We accept and cherish that we are light unto each other. This increment of time offers us an upward swing to the matters and circumstances of our lives. The load is lifted and carried on the wings of angels. New Moons are a time of planting seeds. The seeds in which we are about to plant are luminous. As we plant them, we are imbued with vision and trust. We are moving through our lives, facing struggles, challenges, and lessons, rising to the occasion of what each day brings. We are functioning to capacity, coping, reckoning with what is. Out of the blue, we wake up one day knowing that all is well. It is as if the universe has pressed a cosmic automatic reset button within our being. We are primed for awakening. We see the bigger picture. We are gifted with crystalline wind chime awareness. This is such a time. The New Moon in Sagittarius serves to invigorate our spirit. 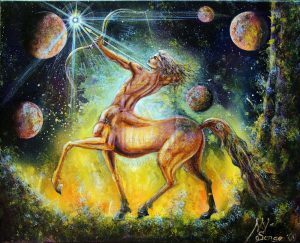 Sagittarius The Centaur is a mutable masculine fire sign ruled by Jupiter. 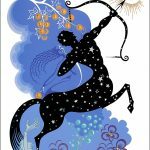 Sagittarius embodies the archetypes of The Wanderer, The Visionary, The Scholar, The Optimist, The Truthsayer, The Teacher, and The Healer. Sagittarius is a Lover Of Humankind. The Sagittarian speaks with a universal voice. They offer us inspiration, spirituality, optimism, faith, and truth. Through the eyes of Sagittarius we see the bigger picture. There is fervency about society, humanity, and world affairs. Sagittarius expects us to expect a lot from each other. The last New Moon before the beginning of a new year marks a period of preparation for the year to come. This is a time of deep deep self-reflection and contemplation of what may lie before us. Upon the closure of the Sagittarius season we arrive at the Winter solstice. Wonder. Wander. Watch and listen. Choruses of angels are whispering our songs. The cup is half full. Our hearts are overflowing. Sagittarius New Moon Blessings Upon You. The Full Moon arrives at 0 degrees of Gemini on Thursday, November 23 at 12:39 AM EST. In the grand scheme of life, the Moon exemplifies a constancy which often goes unseen in this ever changing world. The Moon is always there, even in the darkness of its newness. When the Moon is full, we are full as well. When we tap into the inner most sanctum of our consciousness, the once dormant nature of our fullness reveals itself as a celebration of something innately present, long withheld from recognition and expression. Awareness precedes transformation. The inception of this revelation began at the New Moon, where seeds of intention were firmly planted in the rich soil of our fertile being. At this juncture, The Gemini Full Moon looms ever larger and brighter with an ebullience that symbolically exemplifies an exalted facet of our nature. We in turn experience an inner magnificence that beams with the luminosity of the soul’s true essence. Wherever Gemini resides within your natal chart there is profound opportunity for the channeling of exquisite awareness and open communication. Gemini is exemplary of the reconciliation of opposites, thus possessing an innate ability to facilitate unified consciousness in the face of a society that operates within a field of duality. As oppositional perspective is paramount to the suffering and hostility that abounds in this complicated and conflicted societal milieu, Gemini consciousness constitutes an unfettered awareness of opposites fueled by compassionate perspective. Gemini has a facile ability to be-hold all of it; thus hold all of it. When operating at it’s evolved level of expression, Gemini inspires us to see the bigger picture, behold the other; hence invoking a new humanistic landscape that will emerge when the dust of destructive duality settles into a field of unconditional unity. Gemini The Twins is a mutable air sign ruled by Mercury. The enlightened qualities of Gemini are adaptability, versatility, charisma, vivaciousness, intellectualism, curiosity, self-expressiveness, communicativeness, independence, self-education, playfulness, humor, and wittiness. As the esoteric ruler of Gemini is Venus, Gemini is characterized as having a strong love vibration. Gemini is the master sign for the reconciling of opposites, thus shedding light upon dualities with an innate ability to see the full spectrum of people, life, and circumstances. As with all of the signs of the zodiac with their unique and varied expressions, there is a spectrum from which they operate depending upon the development of the individual’s personality and soul. The less evolved characteristics of Gemini include behavioral expressions of gossip, flightiness, restlessness, inconsistency, shallowness, and fragility. The archetypes of Gemini include The Teacher, The Witness, The Storyteller, The Reporter, and The Trickster. We are in the midst of powerful Gemini energy! A longing to communicate abounds! There is an air of anticipation. Words swim within the waters of the soul. It is an opportune time in which to speak of the inimitable truths that are upon our hearts. Heartfelt communion with another is the elixir of life. Fellowship leads to the unfolding of the true self as we serve as mirrors unto each other. Stand in your truth with supple legs. Anoint yourself with sacred words. Speak them to yourself. Speak them with another. Behold the recognition that in doing so, you are speaking with The Divine. Gemini Full Moon Blessings Upon You. 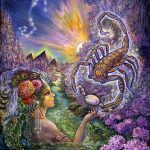 The New Moon arrives at 15 degrees of Scorpio on Wednesday, November 7 at 11:27 AM. During a New Moon cycle, the Moon and the Sun are aligned in the same sign. New Moons present a gift of subjective insight within a specific realm of our psyches, thus offering to us within this very realm a new beginning imbued with fresh awareness. As the Moon is hidden from view, this newborn perspective is deeply internalized. Unaffected by influences outside of the self, it is a time in which to trust oneself. New Moons offer some of the most intimate moments we can ever have with ourselves. This begins a 29-day cycle in which we have opportunity to initiate growth in some realm of our being or particular area of our lives. It is a time in which heightened subjective awareness is more readily available to us. Seeds of nascent consciousness stir anew. We can watch the growth, fruition and completion of whatever we discover throughout the entire lunar cycle. We have all been pushed to our limits in recent weeks. Between the string of violence that continues to sweep the United States and beyond, coupled with the anticipation of the midterm elections, we have been facing the collective darkness, and with that, our own darkness as well. We have been driven to reach within the deep fathoms of our hearts, where we find ourselves reviewing past personal experiences and how perhaps we can heal both ourselves, another, or a situation at large. As we contemplate the human psyche, one may ask, what is darkness? It is an inner realm wherein we cannot see the light; within ourselves, or within any given experience or situation. It is a state of being which we deem unacceptable. Unlovable. Irredeemable. Darkness is an area of both the collective and personal psyches. Darkness emerges when fear dominates love. At this juncture, Scorpio the Scorpion is inviting us to dive into the deep well of inner darkness, for it is within these depths of consciousness that transformation of the highest order awaits us. Scorpio is a fixed water sign, ruled by Mars and Pluto. The qualities of death, depth, darkness, intensity, power, passion, faithfulness, bravery and focus are ever present to us as we embark upon the inner quest. Wherever Scorpio resides in our natal chart is where we fully embody the darkness. It is an area of profound personal power. This realm of our deepest wounding offers tremendous opportunity for transformation within this lifetime. And yet, it can act as a blind spot that lives in exile from our greater wholeness. At this time we have the will, the vision, the capacity and the courage to face our darkness, our human shadow: that which we deem unlovable. This place is one in which we have perhaps neglected to inhabit. It is a realm of difficult psychic, emotional, psychological and spiritual matter. While it is an area of the psyche that we have neglected, for it can feel like just too much to face and feel, this very area of trepidation is powerful beyond measure. When these emotions are faced and felt, we rise from the ashes like the phoenix, a powerful mythological symbol closely aligned with Scorpio. We die in order to be born anew. We may find ourselves undergoing deep alchemical processes whereby transformation, transmutation and transfiguration are means for transport from the uncomfortable inner complacency which has been longing for recognition and release. Herein, beneath the darkness, lies the true gold of our inherent nature, our divine essence; the purest and highest expression of the true self. What areas of your life have reached a place of completion? Do you feel a kind of death to your old self? Can you release people, places and situations which no longer serve your highest good to the light? Where do you need to take a risk? How can you best recognize the dark emotions through the lens of love? Where are you meeting the shadow in the outer world and with whom? Can you behold your deepest wound as the source of your greatest gift? Scorpio inhabits the peak of Autumn. As we celebrate the beauty of nature in her cycle of death, let us celebrate the beauty of our own nature. The darkness is a sacred chamber. New Scorpio Moon Blessings Upon You. 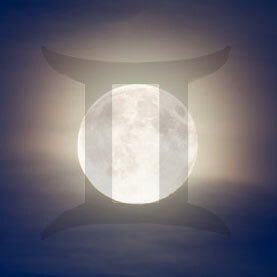 The Full Moon arrives at 1 degree of Taurus on Wednesday, October 24 at 12:45 PM EDT. We are once again at the pinnacle of another round of awakening. The Lunar cycle is a microcosm of the Solar cycle. It takes one complete year for the Earth to orbit the Sun taking us through the zodiac, whereas the Moon cycle takes approximately one month to orbit the Earth. Thus we have small cycles within large cycles. The small cycles are no less powerful than the large cycles. They are however, more immediate pertaining to our personal world. Needless to say, Lunar cycles fly by. We need to stay awake for them. They shed light upon the nuts and bolts of our daily lives and the qualities of relationships that inhabit our world. Taurus The Bull, is a fixed feminine earth sign ruled by Venus. The archetypes of Taurus are The Builder, The Earth Spirit, The Musician, and The Quiet One. 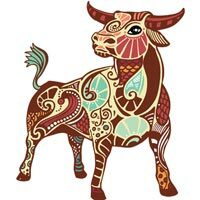 Taurus rules the qualities and characteristics of peacefulness, presence, mindfulness, determination, groundedness, values, self-value, aesthetic appreciation, security, engagement with and commitment to the earth, highly developed senses, and sensuality. As Taurus is the quintessential earth sign, it is highly attuned to the earth, acting as a steward and cultivator of life in it’s myriad forms. Each lunation is highly complicated depending upon which planets are involved with the cycle. This particular Full Moon is mired with the complexity of tremendous intricacy. The multi-dimensional experience now available to us is deep and vast. Do not resist the journey, but rather, embark upon it. We are multi-dimensional beings living in a multi-dimensional universe. At this time, the qualities of Taurus are both challenged, and yet, greatly needed. We must be fully engaged with them. We must embody them. The Bull is surefooted. This steadfastness is greatly compromised by other planetary activity which closely accompanies the Moon. Taurus’s groundedness can assist us through what may seem like the disassembly of some facet of our lives. Hold fast to the earth, for the instability of this lunation will rock us to our core. Taurus is tenacious. We can hold onto ourselves even though it may feel like a tornado has swept us up and taken us to the Land of Oz. During the next three days, there are tremendous karmic opportunities. They may not appear as beneficent circumstances. Whatever appears or disappears will greatly serve your soul. There is unpredictability in the air. A sense of urgency, anxiety, and anticipation presides. Soon, we will have a revelation. 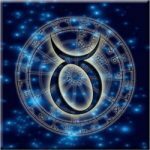 Wherever Taurus resides in your natal chart is an area that will undergo dramatic change. This will happen in such a way as to clear your path for a more veritable journey with what will now become an ever enhanced authentic self. From this time forward, we will express ourselves in no less a manner than veracious. We have undergone extremely difficult lunar phases over the past 2 years. We have been catapulted into our soul’s evolution. Each lunation offers us another round in which to reassemble another piece of our life puzzle. Uranus and Venus coupled with the Lunar Nodes are forming close partnerships to the Moon. It is within the realms of home, family, and relationships that these dramatic changes will most likely manifest. Uranus is the lightening rod that will electrify whatever it touches. It is the Great Awakener. Uranus shakes us up and moves us into our inherent nature; a nature that no longer subscribes to the rules and regulations of anyone or anything that has been dampening our lives. The Lunar Nodes present us with themes of the past; past lives as well as the life that is present. The Lunar Nodes point us toward our karmic curriculum. We have the advantage of deep karmic cleansing and reorientation toward the path less taken; our path. Tune into your values. Live by them; for that is where security lies. Value yourself; for you are valuable. When we adhere to our values, a true and ardent life unfolds before us. We are longing for order. In the grand scheme of life, there is chaos everywhere. Let us embrace that order is chaos and that chaos will order our lives. The New Moon arrives at 15 degrees of Libra on Monday, October 8 at 11:46 PM EDT. The cyclical nature of life in all of its facets brings hope. We are in perpetual motion. Each phase of life has a beginning, a middle, and an end. We are swimming in circular motion circumventing the perennial process that both inspires and motivates the necessity for change in all of its myriad forms. The New Moon is the beginning of the circle which has no end. Here we stand, having navigated the recent journey of this past lunation; different, wise, curious, and energized to begin yet another cycle of exploration. We are standing at the forefront of a deeper layer of potential for our inner growth. We are, all together, a New Moon unto ourselves. What is calling to you? Where must you travel to reach your your next level of awareness? In which areas do you wish to evolve? Just as the Moon, we are unto ourselves in constant flux. We will wax to fullness, recede into darkness, and begin anew. At this pivotal moment of the New Libra Moon, we are still in darkness, introspectively contemplating the seeds which we will sow. The ever constant Moon, our beloved satellite of the earth, teaches us that both the light and the darkness return to each other. And so it is with us. Libra The Scales is a cardinal masculine air sign ruled by Venus. The archetypes of Libra are The Artist, The Lover, and The Peacemaker. Libra’s qualities include equilibrium, love, relational expression, aesthetic sensibility, inner harmony, peacefulness, fairness, partnering, inner balance, and social etiquette. Libra embodies the ability to embody consciously both the shadow and the light. The beauty of Libra is its exquisite expression of balance. We embody all of these Libran qualities. They reside in a specific area of our natal chart. They are activated for each of us in different styles and manners. These qualities are profoundly available to incorporate into wherever this particular New Moon cycle falls for us. Knowledge of one’s natal chart is extremely helpful in understanding the specific area that is during this time, calling forth. As with all lunar cycles, the qualities of the sign are always accompanied by other planets and configurations that add both texture and complexity to our current experience. We are meant to carry these other facets into the lunar cycle, thus developing those planetary qualities within the realms in which they wish to express. Of particular importance to this lunation is Venus, the ruler of Libra, which has entered its retrograde cycle. 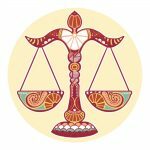 As the planetary ruler of Libra, Venus and the challenges that she faces figure ever more prominently in her expression of Libra at this time. A retrograde cycle is likened to the concept of the underworld as it leads us into the more unconscious dimensions of that planet, thus into the darkness, where we can embrace our shadow with love and acceptance. This is an essential undertaking in order for our return to the light. Venus embarks upon the underworld every 18 months for 40 days and 40 nights. As Venus is in retrograde motion, our relationships take on new meaning. We contemplate those with whom we are intimate. We evaluate our relational patterns. We look into the relationship that we have with ourselves. We gaze upon the other with new eyes. As with all underworldly experiences, not only must we accept our own darkness, we must allow our loved ones their darkness as well. This is where true love in its myriad forms resides. Libran love requires that we embrace this duality. Pluto is closely accompanying this lunation. Pluto’s close companionship with the Sun and the Moon intensifies even further the underworld experience. How do we embark upon this without fear? Fear of loss. Fear of death. Fear of each other. Fear of life itself. It is only in meeting our shadow with open arms that we can find our way through the tunnel that leads us to the light. It takes courage, faith, and non-attachment to how we may behold ourselves. No one wishes to face the darker aspects of their character. However, in doing so, we emancipate our soul. As we navigate both the light and the dark, we grow our love to fruition. We sweep out the cobwebs that have been hiding in the corners of our psyche. We rise from the ashes. We shed our old skin. We gaze into the mirror and look upon our new complection. We are winter. We are summer. We are autumn and spring. In both shadow and in light, we are equally magnificent. Libra New Moon blessings upon you. “Every ending is a new beginning. Through the grace of God, we can always start again. The Full Moon arrives at 2 degrees of Aries on Monday, September 24 at at 10:52 PM EDT. Our Moon. We are amazed by her. She is ever constant. Even within her ever changing nature; from New to Full to New again, she is present. All that we have to do is look up. If the night sky is cooperating, we have a spectacle that is all her own. Even if we cannot see her; she is there. It is her shapeshifting nature that contributes to the constancy of her counsel. During a Full Moon cycle, we literally “see the light.” The light of the Sun’s full ebullient reflection is cast upon the Moon; thus, upon our own psyches as well. We are primed for awakening and revelation. Each lunation is accompanied by fellow planetary travelers, who imbue the lunar characteristics with additional layers of nuance, meaning, and experience. Thus, we are graced with the gift of multi-layered consciousness which in and of itself assists us in accepting and understanding the complex beings that we are. On this particular leg of our journey, the Moon has her own escorts. Mercury, Saturn, and Chiron are all traveling closely with her. Thus, they are companions; not only to each other; but to us as well. This makes for a most complex array of energies that are bound to bring difficult yet profound matter to the surface. Within such times as these, courage is our guide. 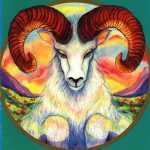 As Aries The Ram is the quintessential sign of courage, we have The Ram’s assistance to face whatever rises to the surface of our conscious awareness. 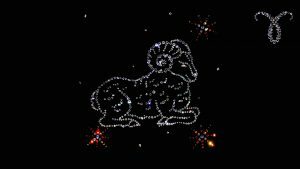 Aries The Ram is a cardinal fire sign ruled by Mars. Aries embodies the archetypes of The Warrior, The Pioneer, and The Loner. The qualities of Aries include courage, instinctiveness, assertiveness, passion, enthusiasm, individuality, innovativeness, creativity and leadership. When Aries is immersed in the lower vibrations, it expresses as immaturity, impatience, selfishness, anger, violence, arrogance, recklessness, and tyranny. When we are willing to embrace both the shadow and the light of our sacred being-ness, we become primed for true transformation layered with intimate compassion for both self and others in recognition of the complexity of being human. As the first sign of the zodiac, Aries speaks to our primal instincts. As a mountainous creature, The Ram is no stranger to going it alone. This is a time encumbered with loneliness. Even amidst our loved ones, there is an existential experience of solitary embodiment. It is within the insulation of such aloneness that we have the space in which to allow for emergence of those dimensions of our psyche that have been all too painful to recognize and bear. Despite the discomfort and edginess of this lunation, there is an opportunity to clear out the debris of shadow elements that have only served to keep us rigidly attached to our suffering. In order to emancipate ourselves from such a state, we muster the courage to feel. Feel all that is there. Do not shy away from it. It is not a permanent condition. For now, the pain and emotionality of our condition serves as a wave that will wash us ashore. Chiron, The Wounded Healer, is right by The Moon’s side, thus bringing the wounded expressions of Aries to the fore. These wounds are ones of identity crisis, fear, and difficulty in being the magnificent individuals that we are. It is where we are called to be true to ourselves within our inherent nature. Whenever Chiron appears, we are catapulted deeply into our soul wound, which ironically, is the very arena of our ultimate healing. Wherever the wound resides, lies our greatest capacity to facilitate others with their own healing. Chiron is powerful; possessing healing gifts, talents, compassion, insight, and ultimately, a befriending of the core soul wound with which we have incarnated. Saturn’s role during this lunation serves to bring structure, discipline, and strength to the matters in our life that we are tending to, bringing with it a certain melancholic nature, yet one in which bears great wisdom and profundity. Saturn requires us to do the grunt work of whatever we wish to accomplish whether in the outer world or on the inner plane. Mercury will lighten us up in the midst of all of this heaviness serving as the communicator between the array of archetypes that are upon us. We possess an inner communicator, one in which serves as an ambassador to our splintered selves. Mercury serves this purpose. Mercury is the only God who can traverse the underworld, the earth plane, and the heavens, all three. Mercury ties it all together for us, thus enhancing our self-understanding and the manner in which to navigate this time. We are only two days into Autumn. The days are still mostly equal in light and darkness. This is an optimal time in which to embrace both the darkness and the light. We have an energetic balance in which to navigate both realms. As A Courses In Miracles says: Darkness is the absence of light. As the days grow shorter, we are inclined to travel within unknown realms. There is tremendous power in darkness. Things are born of darkness. So darkness, we must not fear. Trust that during this time, we are on a fast track for awakening. No matter what the outcome, we will be served. In order to become real, we must feel. When we are strong, we belong; not only to ourselves, but to the oneness with all. ARIES FULL MOON BLESSINGS UPON YOU.